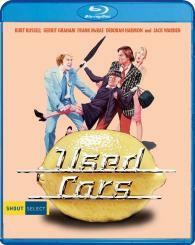 Director and co-writer Robert Zemeckis (Forrest Gump, Who Framed Roger Rabbit, the Back To The Future trilogy) is the engine behind Used Cars — the hilariously raunchy salute to those supersalesmen who'll offer lemons while putting the squeeze on you. Rudy Russo (Kurt Russell, Escape from New York) has what it takes to be top salesman on Luke Fuchs' (Jack Warden) car lot — he's the most charming man who'll ever lie to you. Caught up in a feud between Luke and his brother/rival Roy L. Fuchs (also played by Warden), Rudy gears up for an all-out war. Employing his gifts of gab and grift — along with increasingly outlandish sales tactics — Rudy shifts the battle for sales supremacy into overdrive, turning the lot into a high-octane free-for-all!